“My ankles and feet give me a lot of trouble but as long as my legs last, I will carry on,” says Paul Solis when asked how long he will volunteer at the Old Police Cells Museum. After working for 40 years within the police force, Solis retired and decided to become a volunteer tour guide at the age of 69. 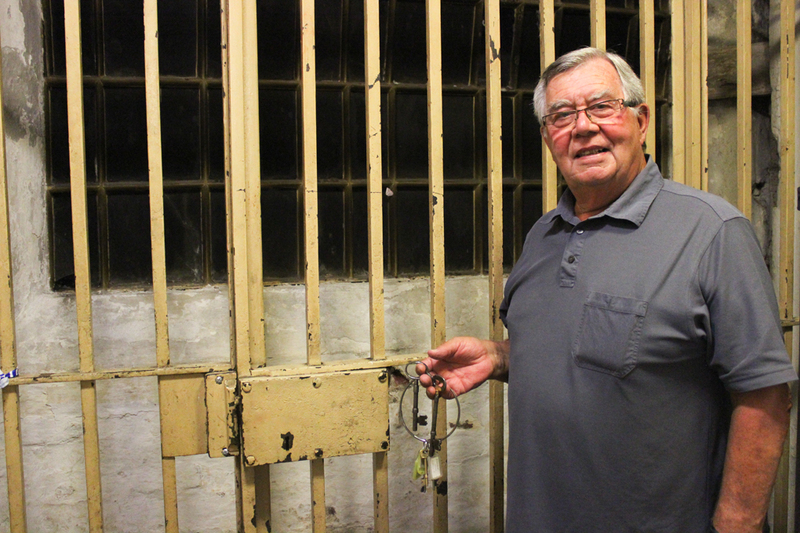 Every week, he goes to the Brighton Town Hall, picks up the old, chunky keys and takes a group of visitors downstairs to show them the old cells and tell the stories and secrets of the former Brighton Police Station which operated from 1884 to 1968. “When the railways came to Brighton the place exploded. On one side, Kemp Town started to be built and on the other side, Hove Brunswick town. In between, there was nothing but small cottages for the workforces. Trouble started when hundreds of workers got drunk and created problems, so a bigger police force was needed. The Brighton Town Hall and the police station were built right in the middle of the town”, explains Solis. The Brighton Town Hall once hosted the police station, cells and the local court. Today none of them function and only the male and female cells can be visited. The rooms are filled with display cabinets where the visitors can take a look at a lot of objects, including old truncheons, wooden rattles used to call for back up assistance before whistles were introduced or the radios used today, and a payslip from a police officer who earned £11.96 weekly in 1956. Walking through the cells, the rooms and walls of the museum reveal the history of Brighton: newspaper clippings of cases such as ‘Death by chocolate’, published at the Brighton Gazzette in 1871 where a woman poisoned several people in town with chocolates; a scratch on one of the cell walls saying ‘Dave the Rocker’ when hundreds of rockers and mods were jailed on the bank holiday of May 1964 after the so-called ‘Battle of Brighton’, and evidence from the IRA bombing of the Grand Hotel in trying to kill the former PM, Margaret Thatcher, in 1984. The museum not only attracts people intrigued by the local history and the police, but also ghost hunters. Along the corridors, on the floor, visitors can find a metal lid covering a well of fresh water that was used in the 16th century. “There was a garden where monks from the monastery in Lewes came to grow fruit and vegetables in 1500s. One day, 40 monks were killed there”, tells Solis. The old memories and stories rest alongside new printer boxes and parcels from the council that uses some of the rooms downstairs as offices nowadays. Solis and 14 more volunteers try to maintain the essence of the place, collecting stuff belonging to former police officers and keeping the rooms exactly as they were in 1800s. “The police force is a family to me. Every two weeks, myself and 8 colleagues from 30 years ago meet in a pub and have a meal and a drink and talk about the old times”, says Solis. Every week you can see this former police officer at the Brighton Town Hall, ready to guide you through the secrets and cells that await you downstairs.